Ten Toes Weekender SUP Review- Is The Board for You? The Ten Toes Weekender SUP is available in six colors including black, seafoam green, and gray, blush pink, green, and blue. The board measures in at ten feet long, six inches thick, and thirty inches wide. It can withstand air pressure ranging from twelve to sixteen PSI and weighs in at twenty-nine pounds. 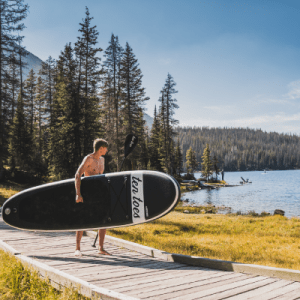 This inflatable paddleboard received quite a lot of positive consumer feedback and is designed for a wide range of skill levels, making it a great buy for the price. This board features a weight capacity of two hundred and seventy-five pounds and comes equipped with a couple of small removable fins and one large removable fin. The board is made from military grade PVC and comes with a nice bungee system for extra storage. The size of the board makes it highly maneuverable and easy to handle. While functional for larger riders, the overall design also makes it easier for riders with smaller frames to handle. Overall, we found the design functional and basic. However, the shape of the board makes it very versatile. This model paddles fairly well in flat water, especially when the large removable fin is attached. The board’s round turned up noise also allows the board to easily slice through the water. You’ll find one bungee cord system located at the front of the traction pad. It’s perfect for securing smaller gear such as a water bottle. This bungee system is very easy to access and is secured with the help of four D-rings. There’s also a single D-ring located at the tail of the board, which is ideal for attaching a board leash. The board’s fin system received a lot of positive feedback. As we mentioned, the board comes equipped with a total of three removable fins. Normally, you’ll see a SUP with only one removable center fin and attached fins on either side of the board. The fact that all three of the fins can be removed allows for more rider versatility in terms of the type of water conditions you can enjoy. For open flat water, you’ll want to use all three fins for enhanced tracking. In rivers or shallow water, you’ll probably want to remove all of the fins, especially if the water is choked with debris. Each fin easily slides into place and is secured with the use of a push-in clip. Once the fins have been secured they remain solidly in place. The manufacturer also sells these fins separately, which is a great option in the event you lose one out on the water. The board’s traction pad is a non-skid EVA. The pad is very comfortable to kneel or stand on. It’s not overly long toward the front, but on this board, you’ll mainly be standing at the center or further back as opposed to standing closer up toward the front like you would with a racing SUP. So, we felt that the traction pad was a decent size for this type of SUP. This model also comes with an extra piece of traction padding, in case the padding becomes damaged and needs to be replaced. The board’s carry handle is placed at the center of the board, which is pretty common with models of this size. 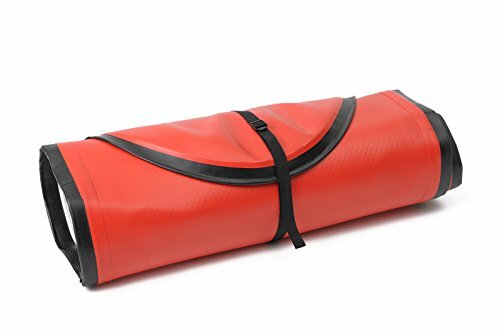 The handle is covered with PVC fabric, which adds some much-needed cushioning and helps to improve the handle’s durability. While it may seem like a small thing for some people, we loved the little carry bag designed for the hand pump. This bag also features a small inside pocket designed for the pressure gauge. This allows you to keep your gear more organized, which is something you’ll definitely appreciate if you tend to tote around a lot of gear. The pump itself is pretty decent. It comes complete with a pressure gauge so you can ensure you’re inflating the board to the correct PSI level. It can take a bit of work to get the board up to the 15 PSI, but because the board isn’t that big it won’t take much time. Some pros recommend purchasing a good electric pump to make life easier. The material used is durable and strong and is made to handle a fair amount of abuse. The six-inch thickness only makes this model more stable. Even though it’s only ten feet long, this SUP is able to hold plenty of weight without any flex. The three piece aluminum paddle is pretty basic, but it’s perfect for paddling over flat water. This is a three piece paddle that breaks apart easily for storage and transport. The paddle can extend up to nine feet and breaks down to around three feet. It also features a quick release system that allows you to adjust the height. Setting up this board is a breeze. Simply take the board out of the carry bag, unroll and inflate. Using the pump inflation often takes about eight minutes. Once the board is inflated, secure the valve cap and attach the three fins and you’re ready to go. This is a multi-function SUP. While it isn’t the fastest on the water, it’s a great performer. The board is easy to paddle and moves nicely, offering a solid feel. The only real drawbacks we came across involved the D-rings and the carry handles. We felt that the board could have used a couple of extra handles, one on each end, to make it possible for two people to carry the board, instead of just the center carry handle. When it comes to the D-rings, we wished there were a couple of extra rings to store more gear. This is one fun board to use that works well for a wide range of applications. If you’re looking for a board that can handle yoga, fishing, touring or leisurely rides, then the Weekender is for you. Consumers who purchased this model gave it a high score of five out of five stars for overall quality and pricing. Ten Toes Weekender SUP Review	Overall rating:	5	out of 5 based on 5	reviews.